Do you often have need to scan files for malware, or just want to make sure before you open or run them? If so this guide may make your computer life a little easier and safer. VirusTotal is a free online malware scanner service where you can upload files of up to 32MB in size, and have them scanned by more than 50 of the best known security names. 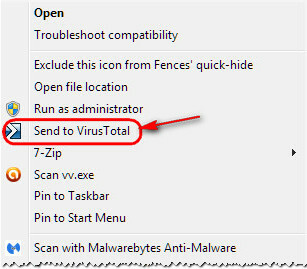 You may be aware about navigating to the VirusTotal web site will then allow to browse your computer, select a file up to 32MB in size, and upload it for analysis. VirusTotal have a couple of free tools available to make file scanning a simpler process. 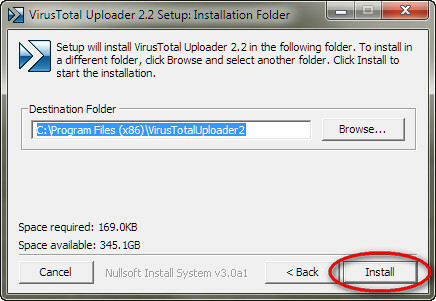 One of these free tools is called "VirusTotal Windows Uploader" and the subject of this guide. 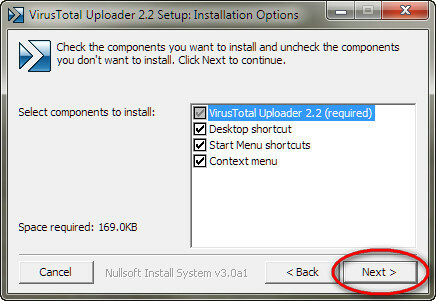 We will show you how to install to add VirusTotal to your right click context menu. You can download it HERE and versions for both Windows and Mac are available. Download the installer to somewhere you can find it, double click the installer, accept any security warnings, and the installer will open with the following dialogue. 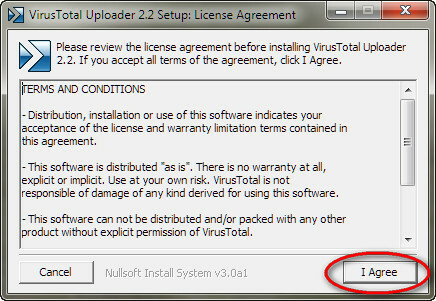 Read the terms and to proceed click "I agree"
Select the components to install, the default should be fine. Do make sure you allow a desktop icon, more on this later. Then click "Next"
Now either accept the proposed default location or select browse and choose an alternate. Once the location is decided click "Install"
After a few seconds the installation complete dialogue will open, click on "Close"
Providing you allowed a desktop icon to be created in the earlier install options, you will now have it on the desktop similar to this one. Congratulations you have successfully installed your new right click context menu application. Let's now give it a try out. There are two ways to use this great little app with the first way being as simple as right clicking the file you wish to scan, then choose "Send to VirusTotal" from the menu. 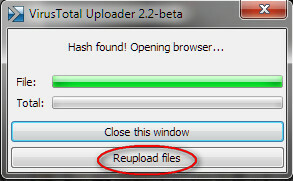 The file will begin to upload and the VirusTotal website window will open in your browser. 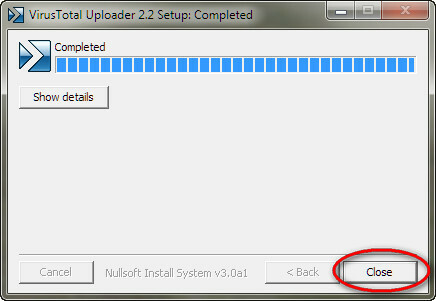 If the file has never been scanned before it will be queued, or scanned immediately. A file previously scanned will display the results of the earlier scan, however if you would prefer a fresh opinion of the file click "Reupload files" and the file will be scanned again. An alternate way to use this app is to simply drag a file you wish to scan and drop it on the VirusTotal desktop icon, hence the importance of creating a desktop icon as we did earlier. There are other ways to add items to the context, or right click menu, but by following this guide you avoid delving into the Windows registry which can be dangerous.There is also the convenience of being able to uninstall the program through the Windows add-remove utility. Give this app a try, and have the added security of having a multitude of top line scanners instead of just your installed ones. As usual if you have any questions about this guide or any computer questions please feel free to ask in our forums.